Medically speaking, for an adult, about 40 to 80 hair falling a day is considered within a normal range. It simply means that one may not consider getting treated for it if this is the case. However, it is also important that if one observes a sudden increase of hair falling even within the normal range, it calls for medical attention and evaluation. Again, if one has hair falling within normal range but if they fall from the roots amounting to a definite reduction in the quantum of the total hair on the scalp, it calls for appropriate treatment. In any case, consistent hair falling over 80 a day and/or reduced hair quantum needs to be evaluated for treatment. 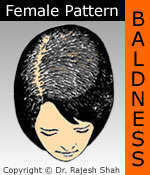 Localized hair falling, leading to even a tiny hairless spot (alopecia) should always be studied and treated. 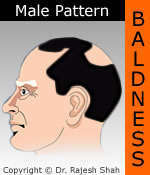 This condition is discussed separately on this website, please click alopecia areata. In this phase, the hair grows rapidly from the follicle. This phase usually lasts for about 1000 days; however, it may range from 2 to 6 years. Longer the anagen phase, the longer the hair will grow.